Recruitment Intelligence™, a research recruitment solution, is revolutionizing the way companies acquire their most valuable resource: People. As they say, “knowledge is power,” and we couldn’t agree more. That’s why we’ve developed a recruitment strategy that empowers employers to gain access to the 85% of passive candidates in the market. 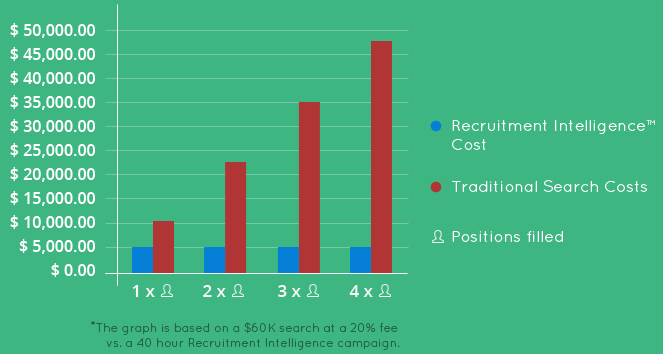 Recruitment Intelligence™ is enabling companies of all sizes to secure the data necessary to hire the most qualified professionals in the market place, all at a fraction of the cost of traditional recruitment agencies and staffing firms. What is your current and best recruitment strategy when you need people talent? If you are like most companies, you probably post job advertisements on the web or reach out to social media sites in the hope that the right candidate will apply. Unfortunately, many of the resumes submitted are unqualified, causing businesses to waste time screening the wrong applicants and candidates. The trouble that most hiring managers face when using these traditional recruiting methods is that they are only accessing 15% of the marketplace. These 15% of candidates are often unemployed and/or unqualified. What’s even more staggering is that there are over 4 million jobs posted online every month, with an average of 300 candidates applying to each posting. Out of all those applicants, a very small percentage of individuals are actually qualified for the job openings the employers are seeking to fill. This is simply a waste of your company’s time and money. Traditionally, in order to gain access to passive candidates, companies hire recruiting firms and staffing agencies to fill job openings. This strategy can be costly- especially for smaller corporations. The recruitment costs become even more prohibitive when needing to make multiple hires throughout the year. Frankly, most companies have limited finances for recruiting fees, and working with conventional employment firms just isn’t in the budget. Recruitment Intelligence will help you Redefine your hiring strategy. ARC Group, a national recruitment agency and the parent company of Recruitment Intelligence™, has been an industry leader for over 30 years. Having worked with companies large and small, in the full-time, contract and temp-to-hire recruiting sectors, ARC Group maintains a wealth of hiring experience. Our clients have communicated the need for a more cost-effective alternative to recruit passive candidates in the market. We have listened. 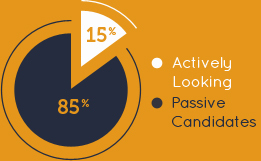 A report that focuses heavily on the passive candidates in the market: The 85%. These candidates are individually identified, contacted, and pre-screened based on your job requirements. This gives you access to recruiting passive candidates who are not actively seeking new employment. These are the individuals who are too busy performing for other companies, and are unaware of the superior opportunities your business can provide. Complete profiles and resumes of all interested candidates. This includes candidates who may not be ready to pursue another opportunity today, but will be at a later date. These profiles and resumes are sorted by their percentage-match to your company’s specific job requirements. Accessibility to this data provides a competitive advantage for our clientele. Not only are you able to consider candidates for your current requirements, but you can also utilize this information to make multiple hires throughout the year, bringing your cost-per-hire down to a fraction of what traditional staffing firms charge. Real-time market analysis of what your competition is paying its employees, including salary, bonuses and benefits data. We leverage our strategic relationships with national organizations as well as our unique candidate due diligence process on each research recruitment campaign. This will bring you the most accurate and up-to-date compensation data. These figures are then compiled into a user-friendly salary report, allowing your company to discover its competitive standing in the marketplace for each employment position you are seeking to fill. Sifting through resumes and scheduling interviews is an extremely time-consuming process. With our exclusive video interview platform, you are now able to watch potential candidates answer the 4-5 provided “knockout” questions; all on your own time, from a computer or mobile device. These short videos will provide you with a preview of the candidate’s personality, communication style, presentation skills, and other intangibles you may not get from a piece of paper. Now you can “meet” the candidates before actually meeting them. This helps to streamline your hiring process and better prioritize your time. The Recruitment Intelligence™ video interview platform does not require you to login or download any software. Simply click the web link and go. You can forward the links to other colleagues involved in the hiring process as well. It’s time to Rethink your recruitment strategy, Redefine your approach, and Rediscover what the most effective recruiting strategies are with Recruitment Intelligence™. Our research recruitment solution will save you money without sacrificing candidate quality. Our candidate screening saves you time by vetting only the top professionals in the market, giving you more time to focus on the bottom line instead of paying high recruitment fees that most employment agencies charge.